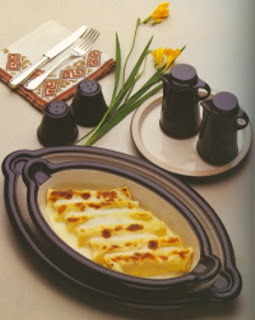 Cannelloni are one of the jewels of Italian food. We made cannelloni our holiday extravaganza this year. We had a "factory" going, taking sheets of pasta, cutting them in to five inch squares, cooking the squares, adding our favorite filling which is a veal and sausage filling, rolling them up and then having them ready for immediate baking or, equally doable, freezing them for easy access for a later day. We made fifty the first go-around.